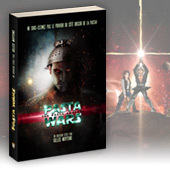 Pasta Wars is a book (novel) written by Gilles Nuytens, creator of this website. For those of you who read French, support me and buy the book! Story: « While planet Spaghetta was enjoying a hard-won peace for several decades, Vermicelli, a young Spaghettan, was about to embark in spite of himself in a quest that would propel him beyond his imagination. To survive, he would have to appeal to this mystical power called "PASTA". The Pasta was a power which, according to legend, allowed the one that is capable of mastering it to dominate the world and much more! But this "force" also had a "Dark Side" whose legendary Darth Noodelicious had been the most ruthless representative ... And without warning, the pangs of war would again fall on the galaxy... » MAY THE PASTA BE WITH YOU... ALWAYS! For those interested, here is the first short story Gilles Nuytens has written, 2 years ago. Now finally translated in English! Comments & feedbacks welcome! Gerry Anderson's Firestorm - kickstarter campaign! Space Opera Society needs your help! A few weeks back we spoke to you about a great project called "Space Opera Society", which is a non-profit production company formed to create new and original Sci-Fi programming to be distributed on the web, and that you, the viewer, would help influence. This company is made up of an outstanding team of international professionals (writers, actors, directors, make up artists, production designers, model makers, VFX artists) who have worked on such productions as Star Trek, Battlestar Galactica, Space: 1999, Stargate, X-files, Dune, Alien, Outland, Tron and many more... and they need your help to make the project come to life! Hello scifi fans! Aren't you a little tired to see your favorite shows being cancelled in the middle of the action, in the middle of the story, after a horrible clifhanger that will never been solved? Here, we may have a great opportunity to make things to change! Check this out! Ethan stars in the sci-fi thriller Dragon Day. Ethan, plays the lead role of Duke Evans, a laid off NSA specialist who is trying to give his family a simpler life. However, their dream is cut short as a devastating Chinese cyber-attack destroys U.S.
Christian Pitre stars in the action adventure film Bounty Killer, also featuring Gary Busey, and Kristanna Loken. Christian portrays Mary Death, the most popular celebrity bounty killer in this post-apocalyptic world where white-collar criminals’ greed has turned the US into nothing but a barren wasteland. Sarah Edmondson went on to numerous lead and supporting roles including Andromeda, Stargate SG-1, Dead Zone, Fringe and recently Continuum. Beau Billingslea portrays Captain Abbot of the S.S. Bradbury in JJ Abrams Star Trek Into Darkness. Captain Abbot is already signed on for the next film in Abrams Star Trek franchise. Jeremy Raymond is a rare talent with a unique character. After having seen some of his work, JJ Abrams offered Jeremy a featured role in Star Trek Into Darkness. He plays the lead Nibiran. Most recently Richard Harmon has reprised his role of the recurring character "Julian Randol" in season 2 of the scifi show Continuum. Nicole Muñoz is a multi-talented young beauty that you can see at the moment in Defiance as Christie McCawley. Her past appearances include a role in Stargate Atlantis, Sanctuary. New exclusive interview: with actor Brian White (Beauty & The Beast, The Cabin in the Woods, In the Name of the King: A Dungeon Siege Tale). Gilles Nuytens has teamed up with Eric Chu (Battlestar Galactica concept artist) to write a sci-fi short story. Originally intended to be a short movie, this short story is written by Gilles Nuytens, based upon a script by Gilles Nuytens & Eric Chu. It's got sci-fi, it's got action, it's got fun and it's free! Mark Hildreth is especially known from V fans for playing Joshua. He has also given his voice in many anime series. His career also encompasses music. Rising star Cory Hardrict can be seen at the moment in a lead role in the movie "Warm Bodies" starring John Malkovich, Dave Franco and Teresa Palmer. Savannah Lathem’s most recent film, California Solo made it’s World Premiere at the 2012 Sundance Film Festival and received raved reviews. The film stars Robert Carlyle (Stargate Universe). She also played a small part in Lost. Chelsey Valentine is a young actress starting her career. Amongst her screen appearances, she played "Little Girl in Blue" in "American Horror Story: Asylum" with Jessica Lange. 4 new Stargate Universe wallpapers from Animaniac! 4 new Stargate wallpapers from Animaniac in the gallery! Most recently, Victor Webster starred as the scorpion king in the 3rd installment to the film franchise "The Scorpion King 3: Battle for Redemption". Currently, Victor can be seen in the television show titled "Continuum". Gilles Nuytens' New Professional Website! Gilles Nuytens, creator of this site has now his own professional website! Check it out and support him, join his Facebook page as well! Meet Cameron M. Brown, an actor who at the ripe age of seven, is already making a name for himself. You can catch Cameron playing Willie Lincoln in the anticipated 20th Century FOX film, "Abraham Lincoln: Vampire Hunter". Eric Bernard is a professional video editor living in Montreal, Canada. His project is to create a movie that would be a sequel to Space 1999, giving it an ending and would answer all the questions. The project has already the support of many people from the original crew as well as Wes Sargent, vfx lead artist on all the Stargate series. This interview contains EXCLUSIVE CONTENT AND INFORMATION. Cynthia Addai-Robinson can currently be seen on the hit Starz show Spartacus: Vengeance, playing the series regular role of ‘Naevia’. Check out this short movie with Gilles Nuytens, owner and webmaster of The Scifi World. This isn't sci-fi, however you will recognize Gilles playing the role of the man with the hat. As you may know, Gilles is also an actor, writer and director while running this site on his free time. Support him so he can write and produce sci-fi in the future! Rachel G Fox has a supporting role in Dream House, directed by Jim Sheridan. Rachel plays Naomi Watt's daughter, and is flanked by Daniel Craig and Rachel Weisz. She is also known for her recurring role as Kayla in Desperate Housewives. Sean Owen Roberts (Painkiller Jane) has just recently begun working as a recurring Guest Star on the television series SUPERNATURAL. Actor Patrick Gilmore can currently be seen in the series regular role of “Dr. Dale Volker” on the hit SyFy series “SGU Stargate Universe”. A new Stargate wallpaper by JCH! Paul Becker has etched a very unique career for himself as of one Hollywood’s busiest choreographers. Look for his elaborate musical numbers in Warner Bros’ SUCKER PUNCH starring Vanessa Hudgens, Jena Malone and Carla Gugin. Support a 3rd season of V, WATCH IT LIVE! A third season of V is still uncertain, but you can make the difference by watching it live and avoid a cancellation! Don't let this show to be cancelled! Too many cancellations lately, don't let this happen once again! Rising star Cory Hardrict can next be seen in a lead role in the highly anticipated big budget sci-fi action thriller movie "Battle: Los Angeles". The Scifi World on Facebook! TSW has now its own Facebook page! 4 new Stargate wallpapers by Martin Marada & JCH! Lance Henriksen is a cult face in the science-fiction genre (Aliens, Alien³, Absolom 2022, The Terminator), and he gained success (and 3 Golden Globes) at the end of the 90’s through his famous role in Chris Carter’s cult serie: Millennium. 5 new Stargate wallpapers from Animaniac! 5 new Stargate wallpapers from Animaniac in the gallery! 10 new Stargate wallpapers by Martin Steil! 1 new Stargate Atlantis wallpaper! 1 new Stargate Atlantis wallpaper by Davide_sd! Eric Bernard is a professional video editor living in Montreal, Canada. His project is to revitalize the old show "Space 1999" with new special effects, timeline, video format, clean the image to make the show more suitable for today's viewers and still keep the same feel and look, and true to the original. To know more about this project, please read the interview. 7 new Firefly wallpapers by various artists! Roberto Urbina plays "Santiago" in the webserie "HEROES DESTINY". Exclusive interview for The Scifi World. Lina Esco plays "Elisa" in the webserie "HEROES DESTINY". Besides her acting for Heroes, Lina has portrayed "Katie Vega" in the television series Cane. 6 new Star Trek wallpapers from Animaniac! 6 new Star Trek wallpapers from Animaniac in the gallery! We've done a brand new interview with Neal Acree. Neal has worked on the music of Stargate SG-1 & Atlantis with Joel Goldsmith. He also scored the cinematic of "World of Warcraft: Wrath of the Lich King" and "The Burning Crusade". New Heroes smilies! Flying Man! French & English subtitles for Heroes webisodes "THE RECRUIT"
For those of you that are interested by English or French subtitles for the Heroes webisodes "THE RECRUIT", we made them for you! French & English subtitles for Heroes webisodes "DESTINY"
For those of you that are interested by English or French subtitles for the Heroes webisodes "DESTINY", we made them for you! French & English subtitles for Heroes webisodes "HARD KNOX"
For those of you that are interested by English or French subtitles for the Heroes webisodes "HARD KNOX", we made them for you! French & English subtitles for Heroes webisodes "GOING POSTAL"
For those of you that are interested by English or French subtitles for the Heroes webisodes "GOING POSTAL", we made them for you! The Scifi World had the opportunity to take part in a press conference with Eliza Dushku. This is the FULL transcription. 9 new Star Trek wallpapers from Animaniac! 9 new Star Trek wallpapers from Animaniac in the gallery!